The Central VA Chapter of AFP offers an opportunity to chapter members who want to benefit from the experience and wisdom of seasoned colleagues through the Mentoring Program. The Mentoring Committee comprises seasoned professionals, each with extensive experience in non-profit management and fundraising, who will meet together with individuals new to the profession (5 years or less of experience in current role) to discuss pressing issues and explore topics of mutual interest. These valued professionals are volunteering their time – there is no charge to participate. 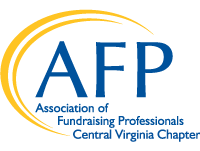 The Central VA Chapter of AFP offers an opportunity to chapter members who want to benefit from the experience and wisdom of seasoned colleagues through the Mentoring Program. The Mentoring Committee is composed of four seasoned professionals, each with extensive experience in non-profit management and fundraising, who will meet together with mentees as a group to discuss pressing issues and explore topics of mutual interest. These valued professionals are offering their time – there is no charge to participate.